Receive a 3% discount at Golfsmith.com. Some manufacturer restrictions apply. Discount applied at checkout. Raise your hand if you've ever hit a "pop-up" off the tee in golf. Mine was raised, how about you? Pop-ups have to be one of the more resentful shots in golf, especially when you're on a long par 5 and you're counting on some extra distance. Instead of hitting a nice long shot down the center of the fairway, you hit a mile-high shot that just barely clears the tees. The problem with some golfers might actually be trying to go for extra distance and then modifying their swing. Most pop-ups occur because your downswing arc is too steep. What ends up happening is that your arms and hands don't extend far enough on your backswing and your hands end up coming in on more of a vertical line on your downswing as opposed to more of a circular or arched path. This often results in scuff marks on the top of your driver head as it is more difficult to turn your wrists and your driver may actually be pointing towards the ground at impact with the ball. There is also the issue of weight shift involved as well. Because your hands come up so steeply in your backswing, you never get full extension and shift your weight to your back foot. This can sometimes result in an opposite weight shift where you actually lean forward on your backswing and then backwards on your downswing. Taking your hands farther back from your body on your backswing will help to eliminate this. One way to think of it is to picture yourself on the face of a clock. If you are looking face-to-face, your head would be at 12 o'clock. When you take your hands back, you want the club shaft to finish pointing towards 1 o'clock (for righties). As you take your backswing, make sure you are taking a full arc, not just lifting your hands straight up over your head. This will also promote weight shift towards your back foot. Then, on the downswing, concentrate on following that same arched path. 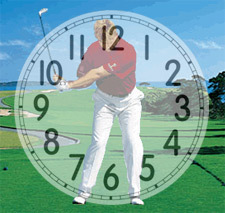 Your weight should naturally shift to your front foot and you should finish with your club shaft pointing at about 4 or 5 o'clock. It may be easier to start the above practice without a ball, just taking free swings. But after you feel comfortable, tee up a ball, and eliminate those pop-ups!